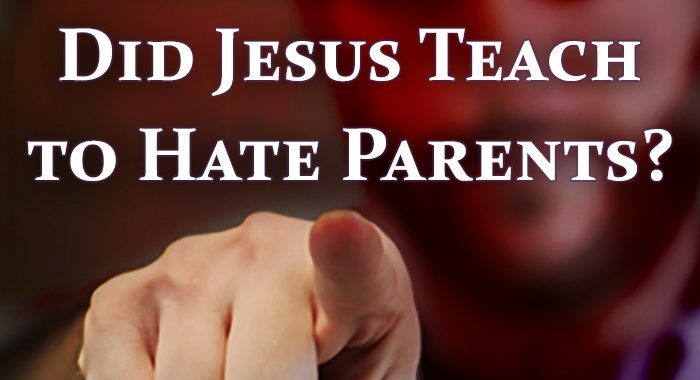 Did Jesus really tell us to hate our parents, spouse, children, siblings and even our own life? If you read Luke 14 you will see where Jesus says this. That is very strange. It doesn’t seem to align with Jesus’ message of love, forgiveness and mercy. It’s hard to believe that Jesus would direct his followers to hate anyone. Let’s look at Luke 14:26 in the King James version to see what Jesus really said. The King James Version spells it out. It clearly is saying that we have to hate them to be a disciple of Jesus. But I don’t think that is what Jesus really meant, based on many other things Jesus said like the below. I think in John 14 Jesus was using hyperbole, which is an exaggerated statement or claim, not meant to be taken literally. It’s kind of like in Matthew 5 where Jesus tells us to cut off our arm if it causes us to sin, or gouge out our eye if it causes us to sin. He didn’t really mean that, but rather was using an extreme example of how seriously we ought to deal with the sin in our lives. I like the New Living Translation better when it comes to Luke 14. The NLT adds the words “by comparison.” So what this verse is really saying is that we should love God so much that in comparison, it will be like we hate those closest to us, and hate ourselves. We need to love God and put Him first in our lives, even above our mother, father, spouse, children and siblings. I’ve seen so many parents who appear to love their children more than God. It is easy to do, because you can see, touch and hold your children, whereas God you can’t physically see or touch Him. A parent decides to allow their child to play a sport which requires them to be somewhere Sunday mornings; causing them and you to miss church. Parents allow their child to get a job, which requires them to work Sundays. We become too busy with life that there is little to no time for prayer, reading God’s word, and disciplining our children. These decisions send a message to our children, that God isn’t as important as other things or people. Our children will follow our example the rest of their lives. Renew your commitment today to put God first in your marriage, family and in every aspect of your life. Have a discussion with your children and grandchildren about how you desire to love God more than anything or anyone else. Encourage them to follow your example, and to help hold you accountable.